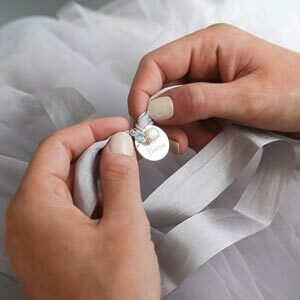 The Personalised Wedding Bouquet Charm is a beautiful disc with a birthstone charm, presented on vintage ribbon. The Personalised Wedding Bouquet Charm adds extra sparkle to your big day! The delicate disc charm is presented on a vintage ribbon that can be wrapped around a flower bouquet and comes with a beautiful birthstone of your choice, perfect for bridesmaids. 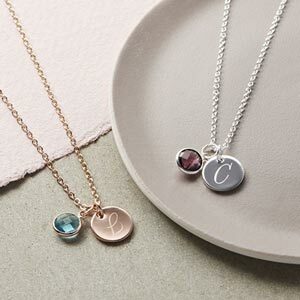 Why not upgrade your beautiful personalised necklace to Sterling Silver to make your purchase extra special? The charm us just so elegant and a perfect size to fit on any brides wedding bouquet.